"Printing was not only a new technology: it also introduced new forms of competition into European society. Most directly, printing was one of the first industries in which production was organised by for-profit capitalist firms. These firms incurred large fixed costs and competed in highly concentrated local markets. Equally fundamentally – and reflecting this industrial organisation – printing transformed competition in the 'market for ideas'. Famously, printing was at the heart of the Protestant Reformation, which breached the religious monopoly of the Catholic Church. But printing's influence on competition among ideas and producers of ideas also propelled Europe towards the scientific revolution.While Gutenberg's press is widely believed to be one of the most important technologies in history, there is very little evidence on how printing influenced the price of books, labour markets and the production of knowledge – and no research has considered how the economics of printing influenced the use of the technology." 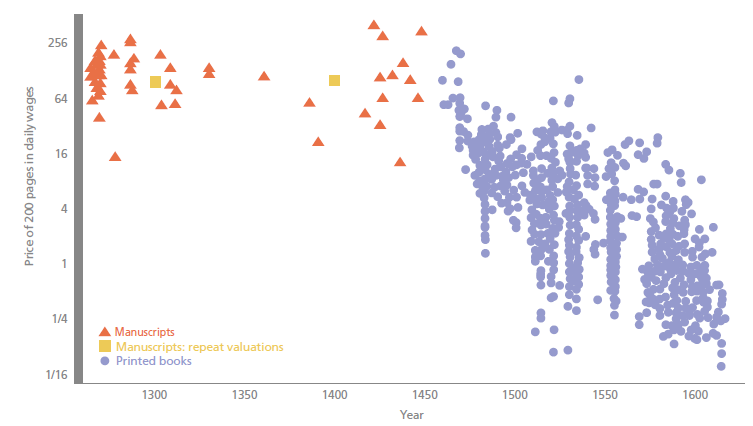 Previous economic research has studied the extensive margin of technology diffusion, comparing the development of cities that did and did not have printing in the late 1400s ... Printing provided a new channel for the diffusion of knowledge about business practices. The first mathematics texts printed in Europe were 'commercial arithmetics', which provided instruction for merchants. With printing, a business education literature emerged that lowered the costs of knowledge for merchants. The key innovations involved applied mathematics, accounting techniques and cashless payments systems.